From the award-winning author of Half of a Yellow Sun, a dazzling new novel: a story of love and race centered around a young man and woman from Nigeria who face difficult choices and challenges in the countries they come to call home. As teenagers in a Lagos secondary school, Ifemelu and Obinze fall in love. Their Nigeria is under military dictatorship, and people are leaving the country if they can. Ifemelu-- beautiful, self-assured-- departs for America to study. She suffers defeats and triumphs, finds and loses relationships and friendships, all the while feeling the weight of something she never thought of back home: race. Obinze-- the quiet, thoughtful son of a professor-- had hoped to join her, but post-9/11 America will not let him in, and he plunges into a dangerous, undocumented life in London. Years later, Obinze is a wealthy man in a newly democratic Nigeria, while Ifemelu has achieved success as a writer of an eye-opening blog about race in America. But when Ifemelu returns to Nigeria, and she and Obinze reignite their shared passion-- for their homeland and for each other-- they will face the toughest decisions of their lives. 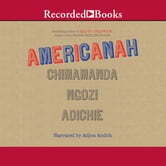 Fearless, gripping, at once darkly funny and tender, spanning three continents and numerous lives, Americanah is a richly told story set in today' s globalized world: Chimamanda Ngozi Adichie' s most powerful and astonishing novel yet.